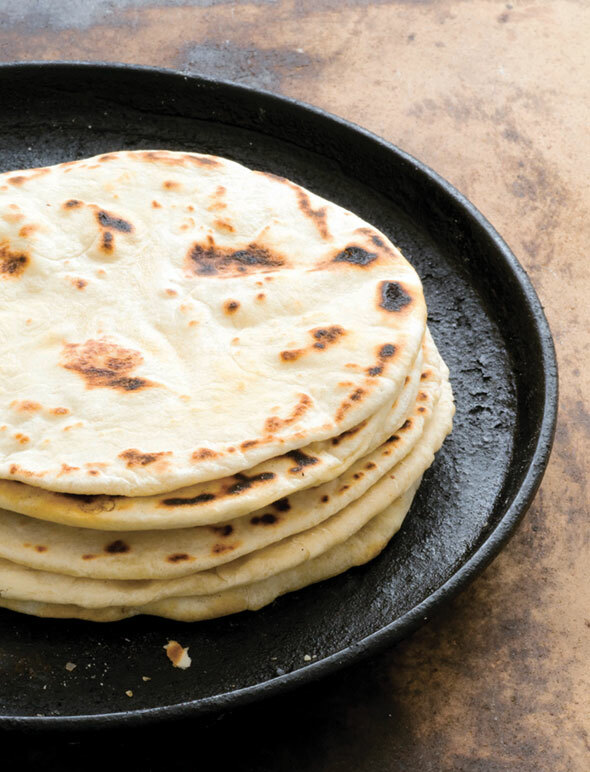 These flour tortillas with bacon fat are soft, supple, and ever so slightly smoky. All they require are flour, bacon drippings, butter, buttermilk, baking powder, and salt. We think you can understand why we’re swooning. Just a word of warning to the wise: Don’t expect those perfectly shaped circles like the mass-produced tortillas the first time you make them from scratch. Homemade tortillas tend to have a certain charming thickness and misshapenness to them. When we made this recipe, we witnessed tortillas in the shape of several states. Some resembled amoeba from our seventh grade science textbook. Others look uncannily like Alfred Hitchcock’s profile. Course, that doesn’t affect the taste in the least. 1. Combine the bacon drippings and butter in a pot and cook over medium-low heat until both are melted. Remove from the heat. 2. In a bowl, stir together the flour, baking powder, and salt. Pour in the melted fat mixture and stir with a fork or pastry blender until the flour mixture is crumbly. Pour in the buttermilk and stir until a soft, sticky dough forms. Plop the dough on a lightly floured surface and knead, using lightly floured hands if the dough is sticking to your hands, until the dough is firm and smooth, about 2 minutes. Cover the dough and let it rest at room temperature for an hour. 4. In a dry cast-iron skillet heated over medium-high heat, cook each tortilla for 30 seconds on one side, flip it, and then cook for 1 minute on the other side. It should start to puff a bit. Flip it again and cook for 30 more seconds. Toss the cooked tortilla on a plate and cover it with a cloth until you’re ready to eat. Repeat with the remaining balls of dough, turning down the heat a notch if the skillet seems to be cooking the tortillas too quickly. This was my first foray into tortilla making and HOLY MOLY, this flour tortillas recipe is a game-changer. I was surprised at how easily they came together. My hands-on time for this recipe was 5 minutes to mix everything together, and rolling out and cooking the tortillas took very little additional time, maybe 1 minute to roll one out and about 2 minutes to cook it. I didn't need to use the tortillas until well after I mixed the dough, so I kept the wrapped dough in the fridge for a day or so and they still rolled out just fine straight out of the fridge. I was surprised at how easily I was able to roll them out and how I was able to get them very thin with just a rolling pin and some flour. I kept the rolled-out tortillas on floured waxed paper for easy cleanup and storage. You could probably roll them out in advance and keep them sandwiched between layers of wax paper in the fridge as well. Once cooked, they were nice and puffed with flaky layers and just a hint of the bacon. I cooked them for a few minutes on each side so I could get a nice char on them. I've used these for taco fixings and with butter and marmalade at breakfast, although they would probably be awesome with some butter and cinnamon-sugar. I could even see these as a great substitute roti, naan, or pita. Amazing. This flour tortillas recipe worked like a charm! The resulting homemade tortillas were soft, pliable, and slightly chewy. Mine also had a smokiness as they charred a bit on my cast iron pan. When I poured the melted fat and butter into the flour mixure, I used a pastry cutter instead of a spoon, which made quick work of getting the crumble. Once you mix in the buttermilk (I used a spoon at this point), the dough is going to be really wet and sticky. Don't worry. Just turn the dough out onto your floured surface and then flour your hands before you start the kneading process so the dough doesn't stick to your hands. The dough firmed up pretty quickly. When I covered the dough I used a piece of plastic wrap then put a dish towel on top of that. The dough balls pressed and rolled out like a dream. I had a tape measure to make sure I hit the 8-inch diameter. When you're rolling these out, be sure to give the tortilla 1/4 turn after each roll. This will help to roll the tortilla into an even circle. The cooking time was spot on. These tortillas will puff up—like, a lot. Don't worry about popping the air bubbles, they will deflate once you pull them off the hot pan. I served these with stewed beans, roasted jalapeños, and sour cream—so good! What a fantastic meal. Yum. Having never tried to make flour tortillas before, I was intrigued by the idea of using bacon fat and buttermilk, especially since I find buttermilk to be such a useful baking ingredient—and who needs an excuse to cook bacon?! This dough was very easy to work with, from kneading it to dividing the nice, elastic, puffy dough, and it rolled out like a dream without too much excess flour. I chose to roll all of the tortillas out at once, placing them between parchment sheets, but now that I’ve done it once, I might save some time when I make this flour tortillas recipe and roll the rest of the tortillas out while I’m cooking the first one. The timing is pretty accurate as long as your pan doesn’t get too hot. When I saw mine getting a little too warm, I reduced the temp a half notch and turned on the fan and the timing worked well again.The resulting tortillas worked great for soft tacos with fish and veggies, and also rolled up and folded nicely, burrito style, without cracking at all. It’s hard to beat a homemade tortilla, and this one is very easy to make, even for a beginner. With concentration and luck, most of them rolled out into a nice circle, although there was the occasional oval or even boomerang shape. Don’t stress about that! It’s something that I am told on good authority takes years to perfect. Many a novice endures having their tortilla efforts compared to interesting-shaped states on the map! Another batch or two of practical experience and mine will be more uniform. I was a bit short on bacon fat, so I made up the short teaspoonful with duck fat since that was handy. I think I could also have used an extra teaspoon butter in its place. The substitution didn’t affect the flavor or texture. My bacon wasn’t super smoky, but it sure worked for texture and ease of rolling out. If you don’t get them thin enough, they really puff up like a pita or naan. Had I known that making flour tortillas was this much fun, I would have at least a million under my belt by now. Easy—yes! Fun—too much so, yes! Good—absolutely! It took less than 10 minutes to mix the dough together and then after the one hour rest, to divide the dough and roll it out into 8-inch circles (umm.... not actually circles on this first round, more like amoeba-shaped whispers of deliciousness). I decided to go ahead and roll all the tortillas out at once and keep them under wraps as I got everything else ready for the breakfast burritos. Then at the last minute, I gave them the cast-iron skillet routine. I timed the first one and then decided it was too confusing to keep trying to time them so I went by looks instead. First side down until I saw the signs of a puff on that side and some good dark spots, then a flip to the other side. I let them go until I could see them start to rise up from underneath and there were some more rest charred spots, then back onto the first side to finish them up. Did this work? Yes, indeed, and quite well. I say go by your intuition and what you see after you try the timing on one or two to get the feel for what you want. Rolling the tortillas out was easy and if I were a real OCD person I might have ended up with circles. I am not and I did not. But they sure tasted great and had some real character! The combination of the bacon grease and butter gave the dough a very light taste that was really good. And the buttermilk finished that taste off with a great sour punch that was the perfect for the burrito fillings. All in all, this flour tortillas recipe is fun, easy, and good to eat. Can't wait to try them again! I declare this flour tortillas recipe a victory. I’ve never had great success making corn tortillas at home. They come out too thick and crumbly. Because of that, I hadn't tried flour tortillas before, but these came out pretty well for a first effort. After a bit more practice, I think these could be a regular product of my kitchen, especially since bacon and buttermilk are two ingredients I usually have on hand. The smokiness of the bacon and tanginess of the buttermilk lent a subtle boost to the flavor. The ingredients came together as they were supposed to at every step. I was able to prep the other ingredients while rendering bacon fat and melting butter. The dough was easy to work with both before and after resting and did not stick to the countertop where I was working.The skillet was probably not hot enough for the first one, as that was the only one that didn't noticeably puff. Maybe half of them were identifiable as round in the strictest sense. They were all somewhere in the general neighborhood of 8 inches in diameter. While they were fairly malleable, I don't think fluffy would be the first word I would use. The tortilla didn't break when I filled one and folded it over, though, so I consider that a success. After cooking the first several tortillas, I added a damp paper towel to the stack of finished homemade tortillas that I was covering with a dry dish towel. A damp towel did seem to make a difference in the moistness of the tortillas.I followed the parenthetical note and rolled each one out as the previous one cooked. It was a bit of multi-tasking, but I didn't lose track of time too badly, and they all came out fairly consistently in that they were almost round, a little puffy, and speckled with various size browned spots. The 30-60-30 direction for cooking the tortillas in the cast-iron skillet was about right and also allowed for some flexibility when they went a little long on one side or other. After making this flour tortillas recipe, I thought to myself, OMG, I actually made a flour tortilla! Who knew that making these could be so easy and that they would be so good?! I've had homemade flour tortillas before, but I guess I never really thought about what went into making them, I was too busy enjoying them. I don't know if I can go back to the store-bought ones now that I’ve seen the light! I mean, really, can you go wrong with bacon, butter, and buttermilk? Those are kind of a few of my favorite things. These were so easy make. I made them on a whim one afternoon and had lovely tortillas for chicken tacos later that afternoon. The only thing that I might note is a salt check. I could have probably added a little more salt to the recipe—maybe another 1/4 teaspoon. It’s really hard to saym though, because not all bacon fat is created equal in terms of saltiness. So, make a test batch, see what you think, and then next time you will know how to adjust. It wasn't off by much and the other ingredients for my tacos helped to balance it, but if these homemade tortillas are truly be the star, the flavoring needs to be right! I used my cast-iron skillet to make these and they cooked up perfectly. These should definitely be eaten ASAP as they don't keep very well. 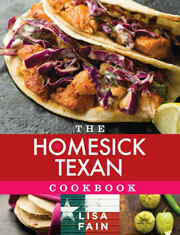 I can't wait to make these for company, then I can say, “Oh, I just whipped up some homemade flour tortillas…!” How impressive is that?! I love finding things to do with the jar of bacon fat that’s always sitting in our refrigerator. This flour tortillas recipe proved to be a good use of a couple tablespoons of that bacon fat. The dough was very easy to throw together. After a couple minutes spent kneading the dough, I found that it was indeed firm and very smooth. Perhaps I’m not as efficient as the author of this recipe, or I just can't multitask well, but I found it difficult to roll out a ball of dough while one of the tortillas was cooking. First of all, you had to cook a tortilla for 30 seconds on one side, turn it over, cook it for 1 minute on the other side, before turning it over again for 30 more seconds. My first tip is that if you have a timer like mine that automatically goes back to the last time set, don’t bother changing it from 30 seconds to one minute. Cook a tortilla for 30 seconds, turn it over, press the timer to start, and when it rings, just press start for its next 30 seconds on that second side. Then turn the tortilla over for the last 30 seconds on the first side. I did try to roll the next tortilla while timing and turning, but it wasn’t a smooth process. Because I was constantly doing something, I felt like I had made a lot of tortillas. However, every time I lifted the towel that I had covering those balls of dough, there were more balls of dough under there. Back to rolling the dough into 8-inch circles. I gave up on that, but it didn't matter to me that my tortillas weren't round. It was fun to see the many varied shapes as a result of my rolling out the dough. One looked a lot like the state of Ohio, and one had a striking resemblance to Alfred Hitchcock. (As I lowered the dough into the skillet, his nose just sort of appeared.) I used a 10-inch cast iron skillet. My tortillas were hard to fit into the skillet, because they were not a uniform shape. They were also very thin, which made the dough spread out as I lowered each one into the skillet. I will be making these again. When I do, I will either use a larger skillet, or I will cut the dough into smaller portions, so that they fit better into the 10-inch skillet. These worked beautifully filled with grilled flap meat which I had coated with this spice rub. Add some fresh pico de gallo made with fresh heirloom tomatoes and slices of beautifully ripe avocado, and you have an absolutely delicious dinner, as well as a fabulous lunch the next day. My husband said that the recipe reminded him more of naan than tortillas. Perhaps it was because the dough puffed up quite a bit in many spots. No matter what you choose to call the finished product, it’s really very good, and well worth making. Flour Tortillas With Bacon Fat Recipe © 2014 Lisa Fain. Photo © 2014 Lisa Fain. All rights reserved. All recipes and photos used with permission of the publisher. I’ve always wanted to make tortillas. Now I’ve got a great-sounding recipe to try. I’m wondering if milk/vinegar mixture would work instead of buttermilk. Dottie, not sure. I’d try it this way first, so you know what it’s supposed to be. Then try the milk/vinegar mix? I started making my own flour tortillas last year and, needless to say, I haven’t bought tortillas since. And also…umm…this makes me want bacon tacos. Is that a thing? Ohhhhhhhhhh, Christina, if it isn’t already a thing it certainly ought to be! And it is now, thanks to you! I’m seeing it as David’s homemade maple espresso bacon and a cup of strong coffee. Or later in the day with chunks of braised and then fried pork belly with a smear of hoisin and a smattering of thinly sliced scallions and coarsely chopped cilantro. And…this has really got me thinking! How are you imagining it?! Hi there, I tried your recipe multiple times and it was great. I decided to double the recipe and put in the fridge, however, I realized I added 1 cup of buttermilk, instead of 1 1/2 cups. I already kneaded it, formed into a ball and put in the fridge. So the question is should I add the 1/2 cup I forgot or not? Hi Minaboom, since the dough has already rested, I would go ahead and begin forming your tortillas. Once cooked, serve immediately or you can allow them to cool, then wrap and store until you need them. The tortillas should keep in an airtight container or zippered bag at room temperature for 24 hours or can be frozen. To freeze, separate tortillas with parchment paper or waxed paper and place in a zippered bag. To reheat, wrap in foil and warm in a low oven or quickly reheat them on a griddle. Monica, these are all good questions. Since we haven’t tried the recipe with your suggested modification we can’t give you an accurate answer. I’m a little concerned about the texture of the resulting tortillas being a little greasy or crumbly if you use all bacon drippings. We can assure you that the recipe works quite well as written with a lovely smoky flavor. Has anyone else tried making these tortillas with all bacon fat? Oh, this looks decadent!! I haven’t tried making them before, thanks for the reminder in the newsletter that Cinco de Mayo is coming up! You’re so very welcome, Carole! Thank you so much for taking the time to drop us a note. We so appreciate it! This is my family’s and friends’ favorite tortilla recipe. The one time we had tacos and I didn’t make these, the whole gang looked at me funny so now these are a staple in my kitchen. They keep great in the fridge, and the recipe works well whether you use real buttermilk, powdered buttermilk and water, or sour milk (intentional or otherwise). Use them as a base for an improv pizza. Trust me. Love everything about your comment, Michelle! And hah, I know that look well, when folks come to expect something and they’re like, woah, what the…?! Appreciate you sharing your substitutions and your pizza trick!